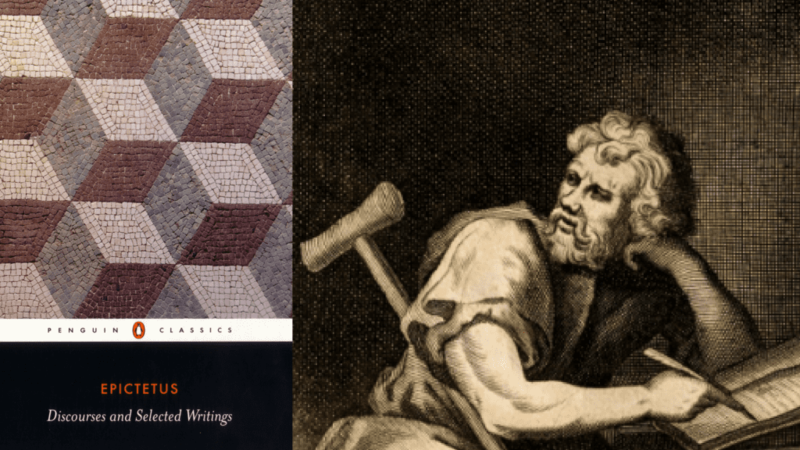 Discourses by Epictetus is a work that only survived thanks to a student named Arrian, who’s credited with transcribing the lessons he learned in Epictetus’ classroom at the beginning of the second century AD. Arrian wrote in a letter prior to the Discourses’ publishing, “whatever I used to hear him say I wrote down, word for word, as best I could, as a record for later use of his thought and frank expression.” A record he later used to achieve renown throughout Rome as a political advisor, military commander, and prolific author – work which includes the biography of Alexander the Great. So who was his teacher? Considered among the big three in Stoic philosophy, along with Marcus Aurelius and Seneca, Epictetus proves the application of stoicism useful to whatever fortunes one may be born. Aurelius was one of the most powerful men of his time and Seneca was one of the wealthiest of his. Epictetus was at the other end of the spectrum. His given name is not known. Epictētos is Greek meaning “acquired.” Epictetus was born into slavery. Epictetus’ mention of his owner, Epaphroditus, is somewhat neutral, not singing his praises nor speaking with any particular bitterness. He does make mention that Epaphroditus allowed him to attend lectures by Musonius Rufus, described by some historians as the “foremost Stoic of his day.” Epaphroditus granted Epictetus his freedom at some indeterminate date and he then devoted his life to philosophy. In AD 95, Roman Emperor, Domitian, unpleased with the reception of stoicism among his tyrannical opponents, expelled Epictetus and other philosophers from Rome. Putting one of his own foremost teachings into practice, Epictetus turned adversity into opportunity, relocating to Greece where he was happy to not have any competition to open his school of stoicism in Nicopolis. His impact does not stop there. Theodore Roosevelt, one of History’s most respected leaders, carried a copy of Epictetus with him along several explorations through South America including the violent “River of Doubt” expedition. Admiral James Stockdale attributes Epictetus as the key to his survival in captivity and wrote extensively about Epictetus’ influence, “I was a changed man and, I have to say, a better man for my introduction to philosophy and especially to Epictetus.” Michel de Montaigne, famous for popularizing the essay as a literary genre, had a quote from Epictetus inscribed in the ceiling of his home. And Albert Ellis, one of the most prominent figures in modern psychology, cites Epictetus as an essential inspiration leading to his development of Rational-Emotive Behavior Therapy (REBT), still a preeminent approach to counselling. Epictetus was concerned with ethics and moral authority. He emphasized practice, not theorizing. Discourses is rooted in common experience and common sense, which helps explain, though teachings from nearly two millennia ago, they continue to inform and shape the lives of present-day readers. Epictetus spent the remainder of his life in Nicopolis. When he retired from teaching, he spent his final years settling into family life, but by that time, old age required he adopt rather than father children. Wanting a family but waiting until retired is a testament to his inherent dedication to his teaching. He had a clear regard for stoic philosophy being of utmost importance in living a meaningful and ethical life. This is a book made up of a collection of his lectures, which is important to consider because similar to Seneca and Aurelius, Epictetus was not motivated by publishing or chest puffing. This four-book work of his teaching showcase an unceremonious enthusiasm, animated by stories and dialogue. He dedicated his life to teaching with the only aspiration being that his students apply what they learn and live better lives because of it. The same would certainly hold true for those who engage with his tutelage today. Below are a few of the recurring themes throughout Discourses. Epictetus taught the importance of distinguishing between what we can and what we cannot control; accepting nature’s course and it’s challenges; living a virtuous life among other virtuous people; choosing freedom by detaching from desires; and being a master to yourself by being a slave only to your mind. You see a tweet counter to your beliefs, you overhear a coworker crack a joke at your dispense, or Netflix freezes in the middle of the episode, and it ruins your day. But it shouldn’t. Outrage, offense, anger, or any other negative emotion do nothing but spawn unnecessary pain. They need not to. Epictetus says, “Remember, it is not enough to be hit or insulted to be harmed, you must believe that you are being harmed. If someone succeeds in provoking you, you realize that your mind is complicit in the provocation.” If we just take a moment before reacting, a reframe of perception can save us from objective and inconsequential matters. By altering our attitude towards setback and shifting our mindset towards optimism or indifference, the stoic makes themself immune to frustration, anger, and unhappiness. One of the rare times Epictetus mentions his years in slavery is to address this point. He never perceived his situation to be one of enslavement. He didn’t live in misery, feel sorry for himself, or perpetuate hatred at his master. Yes, his physical body was in another’s control, but his thoughts, opinions, and attitude could not be seized. How much time does the olympic swimmer commit to the pool before we see them on the podium? How many hours does the author sit at the computer before we see their book on the best-seller list? Or how long must we water the plant until we can enjoy the fruit? Great outcomes demand great commitment to process. Stripping external events of power to be reclaimed by our internal minds is a fruitful outcome. To attain the ability, practice. Epictetus says that our “most efficacious gift,” what distinguishes humans from other animals, the essence of human nature, is the faculty of choice – an ability to act rationally, not impulsively, after careful scrutinizing and assessment. Stoicism, most fundamentally, says that we have no control over what happens to us, we only control how we respond. Epictetus echoes that core tenet and adds that the pivotal goal of education is to distinguish between what we can control and what we cannot, then cultivating the ability to only concern ourselves with that which we can control. He would call that which is out of our control as ‘externals’ and that which is in our control as ‘internals.’ The only thing that matters, the only thing we should concern ourselves with, are the things in our control, or the internals. He believes most problems in a human’s life stem from the inability to distinguish the two and allowing externals to take precedence. By making externals the most valuable things in our lives is to put our freedom, happiness, and tranquility at someone else’s discretion. Most circumstances in our lives – things like our genetics, where we were born, when we will die, and even our bodies – depends largely on factors beyond our control, so there is no sense mulling over those things. He compares it to the weaver, who does not make the wool, but makes the best use of the wool he is given. So how do we do it? He often uses the word ‘impressions’ synonymous with thoughts, feelings, and preconceptions. Those impressions create good, bad, and indifference. We determine the characterization of those impressions. In practice, say your house burnt down. You can say ‘poor me’ and enter a state of grief or anger, but Epictetus would advise to not add to your troubles and instead, start rebuilding. That choice of rebuilding is responding to an apparent bad impression and turning it to indifference. We rational humans have the ability to first assess, then perceive, before choosing how to respond. Irrational beings do not have the capacity to use impressions in a reflective manner, but rational behavior is guided by the faculty of choice. Now understanding the supreme power of humans, Epictetus teaches the importance of putting it to use. He often asks his students some version of, ‘What good is your education if you are not to put it in practice?’ The application of choice is practical throughout Discourses particularly regarding manners presenting difficulties. The choice is between attacking them head on or retreating in a sulk. Without challenges, a comfortable life of luxury looks a lot like sleeping the day away. Every obstacle represents an opportunity. Stoics would all agree on the importance of character and virtue. They would also agree upon the difficulty to constantly maintain living virtuously. You can help yourself by surrounding yourself with those who share the aspiration to live a virtuous life, rather than those covered in dirt. 1) First distinguish between what you can control and what you can’t control. Second concern yourself only with what is in your control. 2) Rethink challenges as not something inflicted upon you or an unfair setback, but as an opportunity to prove your capabilities. 3) Education is useless if you do not apply it to your daily life. 4) Living a life of virtue and dignity is not an easy process so do whatever you have to protect your progress. 5) Freedom is determined by your mind, not by the body, bank account or possessions.